Chinese consumers may be waging an informal boycott of U.S. goods, including Apple's iPhone, Wall Street speculates. Bank of America Merrill Lynch said the sudden drop-off of a broad group of U.S. imports into China may be the same phenomenon impacting iPhone sales. "I think what you see in the data is a broad pulling away from U.S. goods," the firm's economist told CNBC. Chinese customers visit an Apple Store in Hong Kong. Chinese consumers may be staging an informal boycott of some American products and that could be a factor behind Apple's revenue shortfall, according to Bank of America Merrill Lynch economists. Others on Wall Street have made the same claim. BofAML economists have said the sales shortfall could also be due to other factors, including competition, price and the drop in China's currency. Ethan Harris, Bank of America Merrill Lynch chief global economist, said data on trade between China and the U.S. has been very clear and points to the potential of a consumer boycott. "I think what you see in the data is a broad pulling away from U.S. goods. If you look at the charts on imports, it's not just the products where there are tariffs by China. It's a general weakness in imports," he told CNBC. While Chinese purchases of U.S. soybeans dropped, there was a clear pickup in Chinese imports from Brazil. "The soybean story is a big part of it. That was something we all expected. It's the broad-based drop that looks unusual and surprising, particularly since it isn't replicated with other countries," said Harris. "There may be some consumer backlash to American companies, a form of nationalism," said Bernstein analyst Toni Sacconaghi on CNBC last week. But he said there are many things at work with iPhone sales, including a weaker upgrade cycle and the macro picture of a weaker China. "This is partially official policy — e.g. 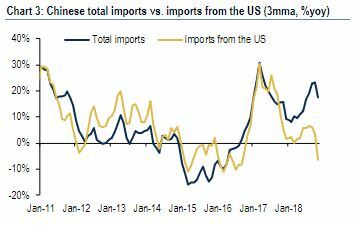 the shift in soybean imports from the US to Brazil — but an informal boycott of US products also seems to be taking place," wrote the BofAML economists. Asked about boycotts, Apple's Cook told CNBC last week that there have been reports of people talking about not buying Apple products because the company is American. "My personal sense is that this is small. Keep in mind that China's not monolithic, just like America's not monolithic. You have people with different views and ideas," said Cook. "Do I think anybody elected not to buy because of that? I'm sure some people did, but my sense is the much larger issue is the slowing of the economy and then this — the trade tensions that's further pressured it." Harris said he has no specific data on sectors that could be impacted by a boycott, but said telecom equipment makes sense as a target. "I think the reason you may expect the handset market to be particularly affected is because there's a very visible battle going on between the Chinese and U.S. governments over exactly these companies," Harris said. "There's U.S. concerns about technology thefts and concerns about trade with nations on the watch list." The Apple comments highlighted that the trade war is hitting both the U.S. and China, though China's economic woes are much deeper. But the BofAML economists said they see a shift coming later in the year, where China's economy will recover due to stimulus but the U.S. economy could be faltering. "You need to get some signs of pain on both sides, then they're both motivated to reach a compromise," said Harris. "I think we're now at that point. I think these negotiations are much more serious than the earlier."